Rahul Mukherji shares a story on how an Olympian can inspire an Olympic hopeful from one part of the world to another. After introducing a promising teenage shooter from West Bengal, India, who last December earned a Youth Olympic spot in the 10m Girls Air Rifle event for Buenos Aires, 2018, I requested Pat Spurgin (now Pitney), Olympic champion in the first Women’s 10m Air Rifle event in Los Angles 1984, to write a note to this promising teenager Mehuli Ghosh. Seventeen year old, Mehuli is the current Asian Youth champion and won a silver medal in Commonwealth Games 2018, losing the gold in a tie-breaker. She has a busy year in 2018 with upcoming Junior World Cup, Asian Games followed by the Youth Olympics. She also has a tournament where Tokyo Olympics 2020 spots will be up for grabs. Just like every sportsperson, Mehuli wants to win an Olympic medal. She is focused and her goal motivates her every day. She is currently preparing for next week’s trials and Junior World Cup from 20 June. 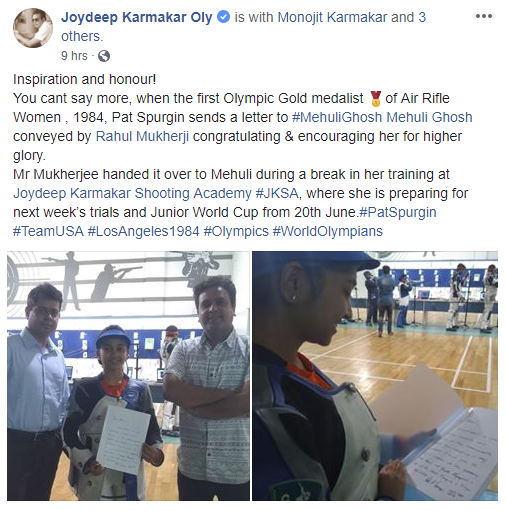 When I handed over an inspiring handwritten note to Mehuli from Pat during her training break, she was so happy and thrilled to receive the note from the first ever Olympic champion in the event she participates in. It was indeed a note to cherish! When I told her Pat is also following her games, she was delighted! One Olympian added that extra motivation to a young Olympic aspirant from across the globe. This is the power of an Olympic champion or a Olympic medalist or simply an Olympian, they can inspire generations to come. This is what sport and athletes are all about. This is what Olympic values are all about – friendship, respect and excellence along with the four Paralympic values – determination, inspiration, courage and equality beyond all national borders, for humanity and a better world!